Chester FC Community Trust is seeking enthusiastic and talented sports coaches to join our expanding team. The ideal candidate will have an FA Level 2 in Coaching Football qualification together with an NGB Level 1 coaching qualification in a second sport. Experience working within a school environment would be an advantage. 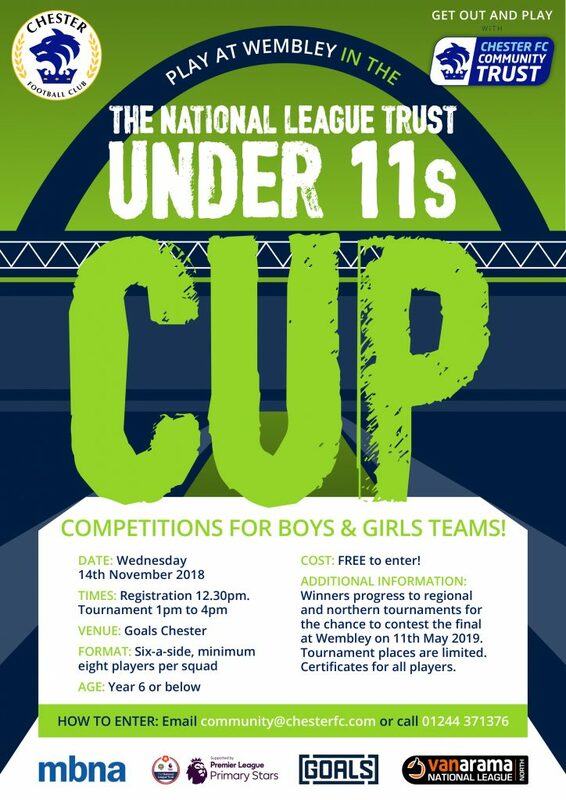 Chester FC Community Trust is inviting primary schools to enter the 2018 National League Trust Under 11s Cup, which gives youngsters a once in a lifetime opportunity to play at Wembley. The annual competition sees National League clubs host local tournaments with the winning schools progressing to regional finals and competing for a place in the overall final at the national stadium. Last year St Werburgh’s & St Columba’s Catholic Primary School from Hoole embarked on an incredible run, winning the Chester FC event and the north west and northern finals before being crowned national champions at Wembley. This year’s event takes place on Wednesday 14th November at Goals Soccer Centre between 1pm and 4pm (registration at 12.30pm). The six-a-side tournament is free to enter and features separate competitions for boys and girls. It is open to primary schools and each squad should contain a minimum of eight players who are in Year 6 or below. The winners of the boys and girls competitions will go through to regional and northern tournaments for the chance to contest the final at Wembley on Saturday 11th May 2019. To enter or for more information, call Chester FC Community Trust on 01244 371376 or email community@chesterfc.com. Chester FC Community Trust has been awarded a National Lottery Awards For All grant to extend its award-winning mental health football project. 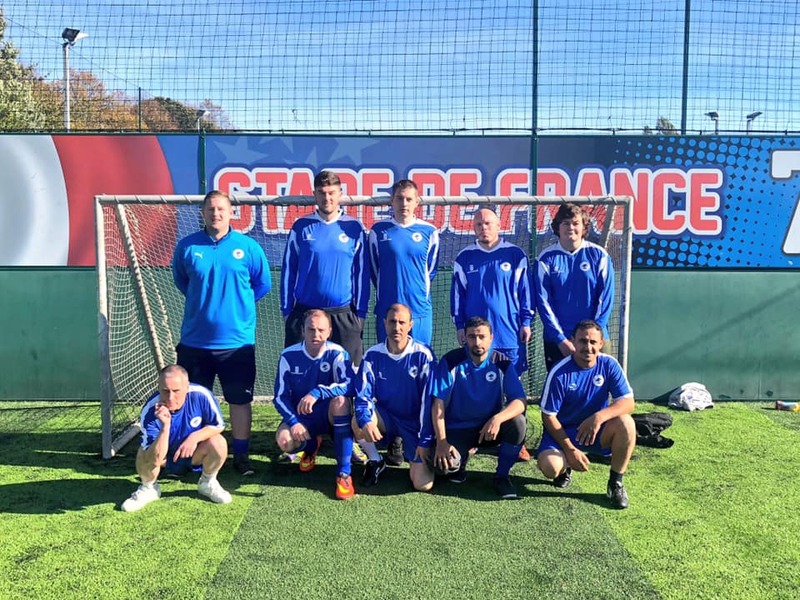 The charity will use the grant of £9,555 to develop new football sessions to engage with and improve the lives of men, at risk of, or experiencing mental health problems. Chester FC Reach Your Goal aims to increase physical activity levels, to raise self-esteem and confidence, to develop coping strategies and build resilience to achieve positive changes to participants’ lives and enable them to fulfill their potential. The project will combine free weekly football sessions with mental fitness and lifestyle coaching, exploring a range of topics and featuring guest speakers who will share their own experiences, and offer participants access to additional support to address identified issues including depression, anxiety, drug or alcohol dependency, homelessness and unemployment. There will be pathways to represent Chester FC in the Cheshire Ability Counts Football League along with opportunities to complete FA coaching qualifications and volunteer with the Community Trust. 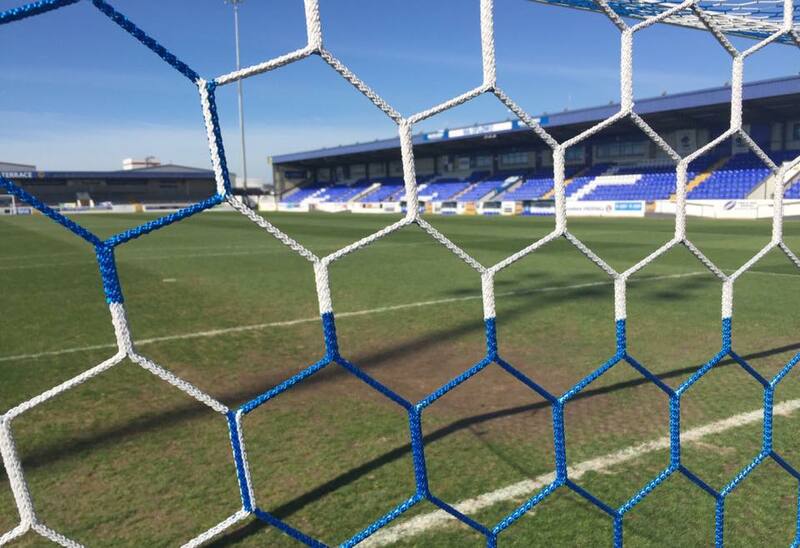 Jim Green, chief executive of Chester FC Community Trust, said: “This is fantastic news and will allow us to build on the success of our existing work around mental health. “We have been running weekly sessions in partnership with forfutures at the Northgate Arena for some time and these have been a great success, however the sessions are now at capacity with an established group of participants so it has been a challenge to manage this. Chester FC Community Trust won Best Health Project in the 2018 National League Trust Community Awards and Best Community Project in the Cheshire FA Grassroots Football Awards 2018 for its mental health project. Please email community@chesterfc.com for more information about Chester FC Reach Your Goal. Chester FC Community Trust have teamed up with Wizz Kidz in Saltney to offer football play sessions for pre-schoolers. 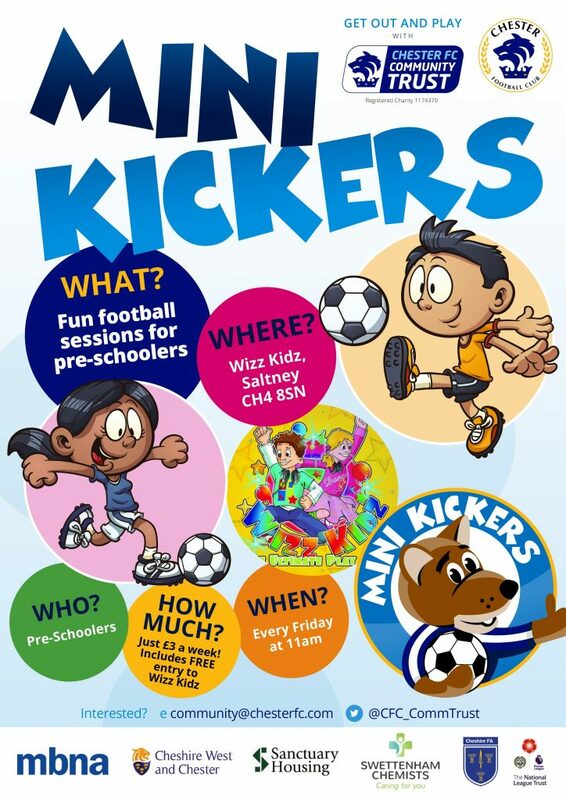 The weekly sessions will run on Friday mornings at 11am and feature fun activities and games for pre-school age children using the fantastic Wizz Kidz football pitch. Just like our regular Mini Kickers sessions, the pre-school sessions aim to develop fundamental movements and social skills while introducing core football skills in a fun, safe environment. Parents and responsible adults are welcome to participate with children too. The sessions cost £3 per child which includes free entry to Wizz Kidz to play. Booking is advised and places can be reserved by emailing community@chesterfc.com. Wizz Kidz can be found at Sabre House, Bridge Street, Saltney CH4 8SN. There is ample free parking with hot and cold refreshments available in Wizzy’z Diner. You can now support Chester FC Community Trust when you shop online with Amazon. The AmazonSmile scheme enables Amazon customers to donate to a charity of their choice every time they shop, at no extra cost to them. Whether its books, music, films or gifts, each purchase you make will raise funds for Chester FC Community Trust as Amazon will donate a percentage of what you spend to us. You will continue to receive the same shopping experience as with Amazon.co.uk and there is no additional cost for using the scheme. It is free and simple to sign up for AmazonSmile and once you’ve selected Chester FC Community Trust as your chosen charity, you will start generating funds to support our work. To get started, visit https://smile.amazon.co.uk/ch/1174370-0 and log in using your existing Amazon details or sign up as a new Amazon customer. Using this link should automatically select Chester FC Community Trust as your chosen charity, however if it does not you can use the search function to find us. You will then be ready to start shopping and raising funds, but remember to make sure you make purchases through AmazonSmile and not just Amazon to ensure we receive donations.